IRRI staff and members of the Board of trustees (BOT) led by Director General Robert Zeigler and Deputy Director General for Research Matthew Morell participated in the Golden Jubilee Annual Rice Research Group Meeting (ARRGM) held at the Indian Institute of Rice Research (IIRR) in Rajendranagar, Hyderabad, 12-15 April. Important items on the agenda were to join IIRR staff in celebrating the milestone 50th annual meeting and to review the progress of the IRRI-India Work Plan (2013-16). Around 500 rice researchers and dignitaries from across India (photo) attended the four-day event and took the opportunity to interact with the visiting IRRI staff members. At the inaugural session on Sunday morning, Zeigler expressed his appreciation of the contribution of Indian scientists to agriculture. “India’s initiative in 1965 by setting up an agency for rice research, now IIRR, was a model emulated the world-over. “India leads the world in food security and its strides in rice research have always been first-of-its-kind,” he said. During a media briefing following the inaugural session (photo), Zeigler said that the importance of rice in India cannot be overstated. “The country must be able to feed itself and, in now doing so, a platform has been provided for economic development and a foundation for social growth,” he told reporters. This year, IRRI researchers and their Indian counterparts joined in discussions on five key areas among the 24 joint projects that are being conducted under the Global Rice Science Partnership (GRiSP): system agronomy, breeding for unfavorable environments, yield enhancement, breeding for direct seeding, and the rice strategy for India and the future of the rice sector in the country. Morell pointed out that IRRI’s commitment to strengthening its presence in India is exemplified by the presence of the Institute’s Board of Trustees in Hyderabad, which held its annual meeting at ICRISAT, 15-18 April. He was pleased to see that the IRRI-India interactions are strong and the progress in the collaborative work plan is being made. “There is a lot of excitement around the technologies being used and the varieties that are coming through the breeding pipeline,” he said. “We have a great foundation to continue into the future.” In the photo (from left) are J.S. Sandhu, deputy director general (Crop Science) for the Indian Council of Agricultural Research; Gurbachan Singh, chairman of the Agricultural Scientists Recruitment Board; and Dr. Morell. During the ARRGM session on Wednesday, Sam Mohanty, IRRI's chief economist, said that India has reached the pinnacle in rice exports. “The country has come a long way in the past 5 decades from a country with a severe food deficit to being a major grain exporter. 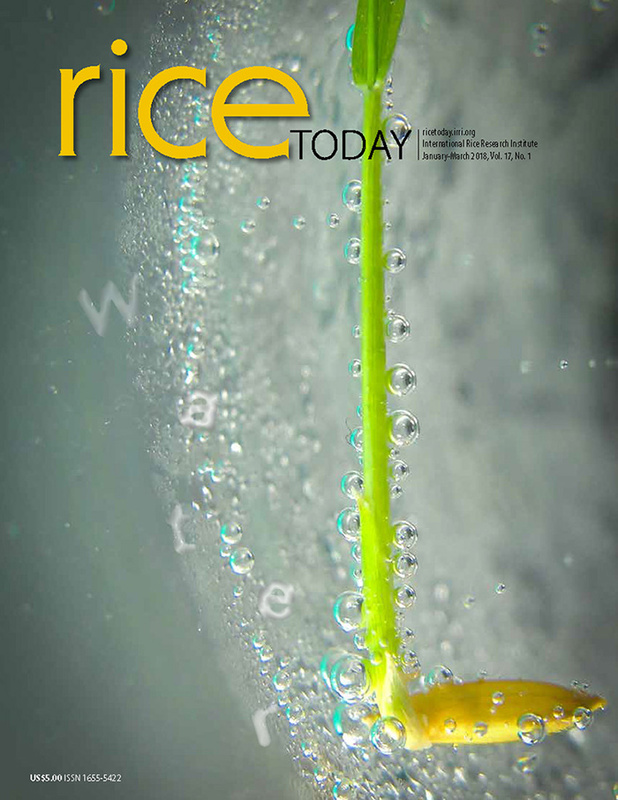 Much of what Mohanty covered is in the April-June issue of Rice Today. At the ceremonial lamp lighting to kick off the 4-day ARRGM are (from left): Madappa Mahadevappa, former chairman of the Agricultural Scientists Recruitment Board; Dr. Zeigler; Dr. Sandhu; V. Ravindra Babu, director of the All India Coordinated Rice Improvement Project; and Subbanna Ayyappan, director general of the Indian Council of Agricultural Research (ICAR). Dr. Zeigler (4th from left in photo) helped hold up a 6-yard-long saree made entirely of rice straw during inaugural ARRGM session. Read more about it in The Hindu. Dr. Zeigler (center) and other Institute staff surveyed progress in IRRI's experimental rice plots on the campus of the International Crops Research Institute for the Semi-Arid-Tropics (ICRISAT). From left with Dr. Zeigler are Dr. Morell; Arvind Kumar, plant breeder for South Asia; Sudhir Yadav, irrigated systems agronomist for the South Asia Breeding Hub; and J.K. Ladha, representative for India and Nepal. During the ARRGM, Gene Hettel, editor-in-chief of Rice Today, visited with the magazine's April-June cover guy, Nekkanti Subba Rao. Read about the incredible story of this Andhra Pradesh rice farmer in Rice Today. On Monday morning, 13 April, an IRRI delegation led by Drs. Zeigler and Morell visited the Professor Jaishankar Telangana State Agricultural University (PJTSAU) in Rajendranagar, Hyderabad, India, to hear about the university's rice research projects and how IRRI can assist. Following the signing of an MOU between IRRI and PJTSAU, staff representatives from both organizations posed for this group photo. See story in The Hindu. At IRRI’s exhibit at the ARRGM, Lanie Reyes, Rice Today magazine's managing editor, interacts with some of the participants as they eagerly sign up for receiving the quarterly electronic version of the magazine. During a break during the ARRGM sessions, IRRI researchers R.K. Singh (2nd from right) and Hei Leung confer with (from left) A.P. Padmakumari and Gururaj Katti, both IIRR principal scientists in entomology. Members of the IRRI Board of Trustees held their annual meetings at the International Crops Research Institute for the Semi-Arid-Tropics (ICRISAT) in Hyderabad, India, 15-18 April. They took time out on 16 April to move from the meeting rooms to the great outdoors to inspect IRRI's research plots on the ICRISAT campus. In the photo, they are joined by members of IRRI's HQ management and India research teams. Arvind Kumar, leader of IRRI's rainfed lowland South Asia Hub plant breeding group, has the rapt attention of some of the Institute's BOT members as he explains ongoing research in IRRI's experimental plots on the ICRISAT campus.